One of the most rewarding and indescribable feelings in the world is experiencing that moment when you find out about a college acceptance. That too in the first list of converts. Being a high Commerce Graduate(B.Com) nowadays isn’t easy, it takes a lot of blood, sweat, and tears (metaphorically, I hope). And during that period of waiting to hear of a decision, you continually question and re-evaluate if all you’ve done in the past 3 years was enough. Whether you find out about the decision from a letter in the mail or by clicking on a link, I think we all can agree it’s pretty much one of the happiest moments to experience. In my case, it was on the 22nd of May, 2018, I received the final conversion through email. The moment I saw the conversion email, I knew that this is where I belong. I did not bother to check any other colleges and I forgot about the ones I already paid the Confirmation Fee for. It was just one for me because like I say in the next few paragraphs, Cost is always a problem. The reason I am really writing this post is to tell you why I chose Indian Institute Of Management, Raipur (IIM Raipur) over other colleges (IIM Kashipur, IIM Rohtak, IIM Udaipur, IIM Ranchi). Waiting to hear from a college is one story, but actually choosing which one to attend is another. I am very fortunate to have been accepted to IIM Raipur, it was one of my dream B-Schools while in College. So, in a sense, it wasn’t difficult for me to know it was this college I wanted to attend out of all the ones I had been accepted to. Having said that, I would like to add that no matter how easy it seems after one clears CAT, the interviews, the shortlists, choosing the right college is much more difficult than it seems. Especially when it is a country with 1.3 billion people where a majority of the youth compete for the best colleges where there are dedicated websites and forums where you can promote, bad-mouth, praise, any college that you want. It plays a crucial role when you are naive and you can be easily manipulated with rumors and hoaxes. The reason lies with the lack of proper guidance, I believe. Not everyone is fortunate to have found the right guide/mentor. Even after that, many have limited funds for these situations, by limited I mean menial. So, choosing the right College becomes an increasingly important task. The city meet conducted by the Admissions Committee of IIM Raipur was a huge success. Everyone(mostly) got their doubts cleared. This was made easy by the joint effort of IIM Raipur, current students of the PGP 2018-2020 batch and the seniors who answered all our queries day and night, trust me, the queries were repetitive and it was not pleasant. But let’s be realistic, college comes with a cost. And though I did not receive any scholarship yet to attend IIM Raipur, it was enough for me to forget about the other acceptances I received. Finances were greatly talked over with my parents. They could afford what most of our society can’t but much less than what many of us here at IIM Raipur can. It was with the help of IIM Raipur and IDBI Bank, which has a dedicated bank inside the campus just to meet the needs of the students who are financially unstable. The process was smooth, my education loan was sanctioned within half an hour (a relief if you ask me) as my father is the sole earner and his CIBIL Score is not that good as he has multiple loans over his name. Yes, I come from a lower middle-class family which is a luxury in a country where 22%(Government Figure) people live in poverty. Even after everything was supposed to be smooth here-on, it wasn’t. My registration was on 9th June 2018. But because of an unfortunate incident in the family, my parents had to leave for a few days and I had to take care of everything from my sister’s school, exams, arranging documents for my registration procedure, the loan, etc. Luckily, all who had their registrations on 9th were shifted to 14th and it was a relief. Being an Optimist and a Superstitious person, I knew this was the sign that hard work and endurance can lead you to your goals and nothing else. 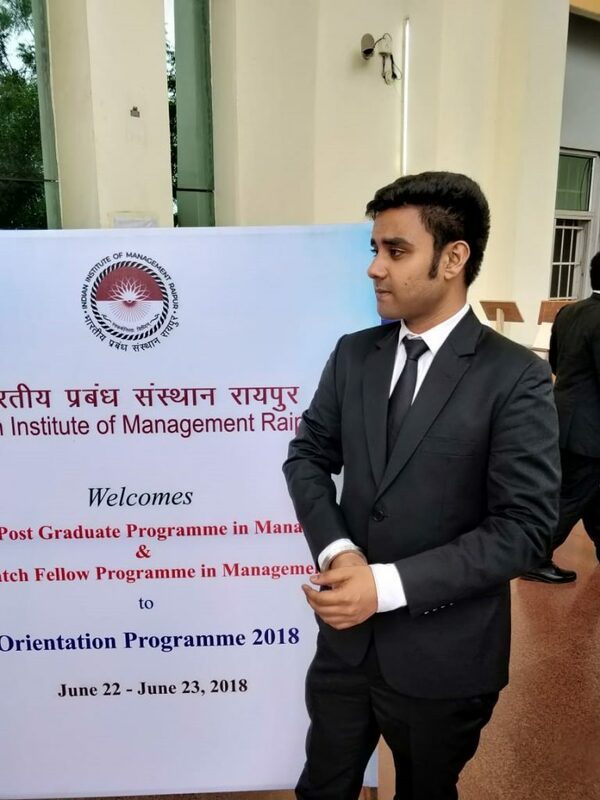 I reached IIM Raipur on 12th May, Got my loan sanctioned, attended the preparatory classes, the orientation, student activities and I already feel I have added so much experience and value to myself in these few days than I did in the last 3 years put together before joining IIM Raipur. From here on, the journey will not be smooth. We will be moving to our new (one of the most beautiful in India) campus very soon. We will face problems, not the sort that comes when to your mind in general circumstances, but together, the family of IIM Raipur will strive and succeed. Like it always has. Lastly, I am proud to be a part of IIM Raipur and I hope that someday IIM Raipur can also be proud that I am a part of this great College. I have always wanted to join one of the leading Retail companies in India and what can be better than the pioneer in leadership, ABG. As my background is graduation in marketing management, I have even interned with an FMCG company, I feel that a role in Retail would be best suited for me and I will be able to perform exceptionally well If given a chance. Everyone in India knows what Pantaloons is when it comes to retail shopping. Each and every brand of ABG Retail is well known and it can grow much further and take a major chunk in the global Retail market if the efforts are channelled properly. ABG is one of my dream companies to work for and it would be a great learning as well as growing experience if I ever get a chance. Tirthadeep Das is a first year student at IIM Raipur. I agree to you on the point that the city meets were awesome.